Over the last couple of years I have been fine tuning my beginners watercolour classes for adults and children. I usually start off with the same lessons for all ages, just moving a little faster, and into more detail with the adults. After teaching the colour wheel and basic brush techniques there are several lessons I run through. I have found that my own watercolour skills are always improved every time I demonstrate these lessons, and therefore recommend beginners and seasoned watercolourists to run through these simple “warm ups” every once in awhile. 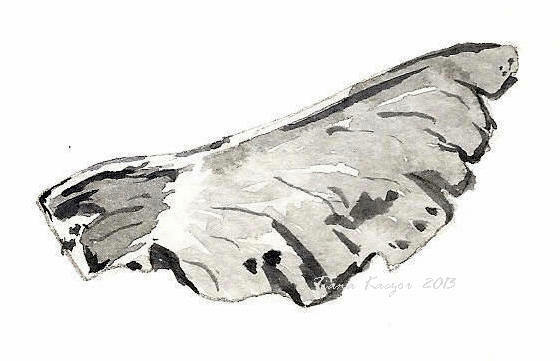 Maple seed value study in gray watercolour. The Value Sketch teaches us to look at the values in real objects and paint from life instead of a photo. 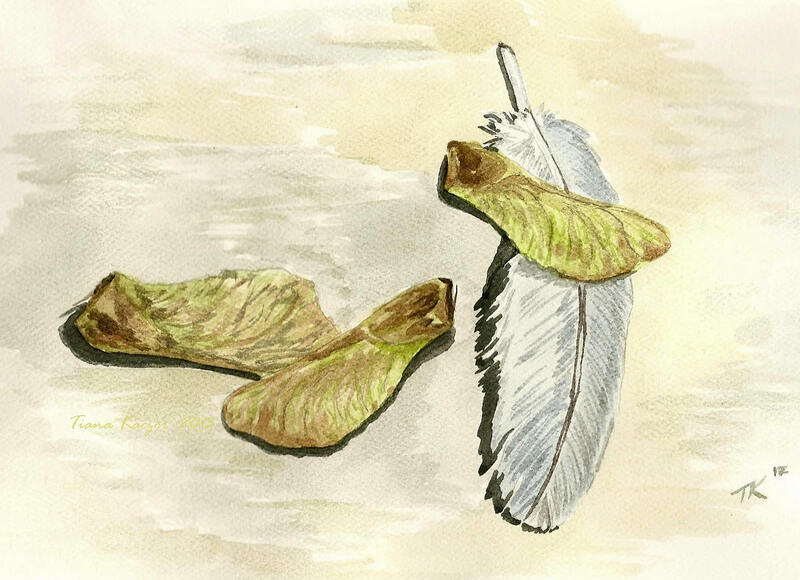 I bring to class some simple found objects like leaves or maple seeds. Sometimes I have the students use only one colour, like gray, and then all they worry about is the intensity of the colour and watering it down for the light areas. Other times I have students try to mix the actual colours on the found object. We mix puddles of the colours in our tray, and leave room to add water for lighter values. Once the colours are ready then we can start the painting. We start with a light pencil sketch. For young children I may allow them to trace the object so they don’t get frustrated with the drawing. Then we apply 3 or 4 layers of paint, working from the lightest areas of the object to the darkest. These are small paintings, so very little paint should be on the brush. We don’t want the colours to run. Then wait a couple minutes for the wash to dry before painting the next layer of detail. The last layer is the darkest areas and then the shadow under the object is added to make it look like the leaf or seed is sitting on a table. The Value Sketch is a quick lesson so I usually do a second lesson in the last half of the class. Since you rarely use white paint in watercolours, but instead leave the white paper free of paint, it’s good to have an exercise that helps students be more aware of the paper and leaving areas blank. 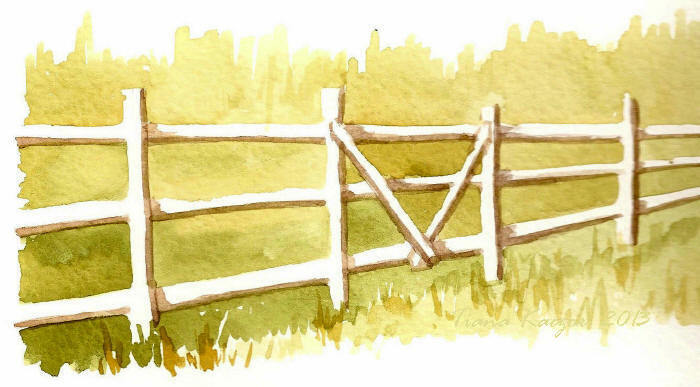 Negative space drawings can be taught if time permits, or you can go directly into an exercise of painting a white fence. We start by lightly drawing the posts and rails using only one line each in the middle. It’s nice to give a little perspective as the fence goes away from you and perhaps add a gate. Next we mix our paint colour puddles, which are the colours of the background of grass or bushes. When we’re ready we can start by prepping the paper with plain water in each negative space area, or we can just jump in and start painting. Try to load enough paint on the brush so that you can finish a whole rectangular space between the posts and rails. Be careful not to get too close to your pencil lines as then you’ll have a very skinny fence! When one negative space is done then load up your brush again and paint the next one. Dip in different colours to add more interest to your background. Be careful not to have each negative space a different colour as that wouldn’t look natural, but instead dip into a second colour halfway through painting one area and work fast so the colours blend on the paper. When dry you could add some detail of grass blades in front of your fence. Then make your white fence 3 dimensional by choosing a direction for the sunlight and painting shadows on one side of each rail and post. When the painting is totally dry lightly erase your pencil lines. If you have any questions about these exercises please write to me in the comment section. Some books I consulted while planning my lessons this past summer were: “Watercolour For Starters” by Paul Talbot-Greaves, and “Watercolour Challenge, Techniques in Practice” Channel 4 Books. This entry was posted on September 27, 2013 at 3:54 pm and is filed under Visual Art. You can subscribe via RSS 2.0 feed to this post's comments.